What a season of ups and downs! The down was mainly comprised of a broken ankle after skiing into a hidden rock just after Christmas; the up was my rapid comeback and third place finish at the Freeride World Tour Fieberbrunn just 5 weeks after the accident. But lets go back a step. Last season, I came closer than ever before to achieving my goal of becoming Freeride World Tour champion. After a crash at the finals in Verbier, I placed second overall behind Arlberg local Nadine Wallner, who showed nerves of steel with a solid run that placed her in second on the day, and first overall. I had tasted blood however and was super motivated to keep training and improving. During my off-snow training, my main motivator was the overall title. My thoughts returned to that title often. From July to December, I worked with my conditioning trainer, Phil Anker, and we made great progress in getting my body strength almost perfectly symmetrical (an issue I had been battling with ever since I ruptured my ACL and MCL in 2007). Come December, I was at the top of my game, feeling physically and mentally stronger than ever and also excited about skiing on the new Kästle BMX skis I had helped to develop. Then, on 26 December, disaster struck. It was a low tide season with little snow fall, and that day it started snowing in earnest. All day we had been skiing low angle, grassy slopes and were having a ball. Suddenly, while skiing in the Seekopf area in Zürs, I hit a rock hidden under 30cm of snow and came to a complete stop. I broke my ankle on impact. I can tell you, it bloody hurt. When I heard my doctor give me his diagnosis of 5 to 6 weeks rest, my world started crumbling around me. I couldn’t stop the tears welling up in my eyes. That means I’m going to miss Chamonix, and maybe also Fieberbrunn! After all that hard training, I’m forced to stay off skis! 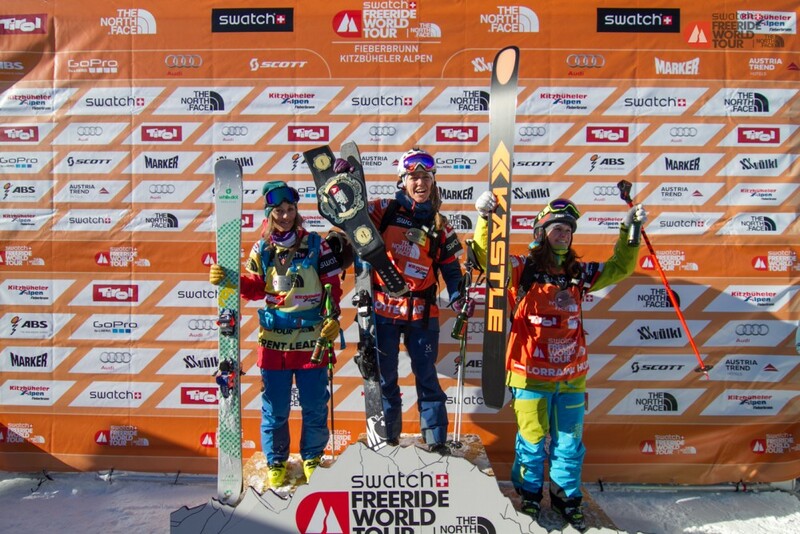 I had built the main purpose of this season up on the FWT championship, and now that goal seemed far beyond my reach. I worked day and night to help my body heal from my ankle injury. My family was also an invaluable support to me. It took me all but a day to build myself up again. I quickly realised there were more important things in life than winning the FWT. I had to use crutches for 4 weeks. I mostly missed being outdoors and up in the mountains, where I get a lot of my energy from. I missed that even more than the skiing. 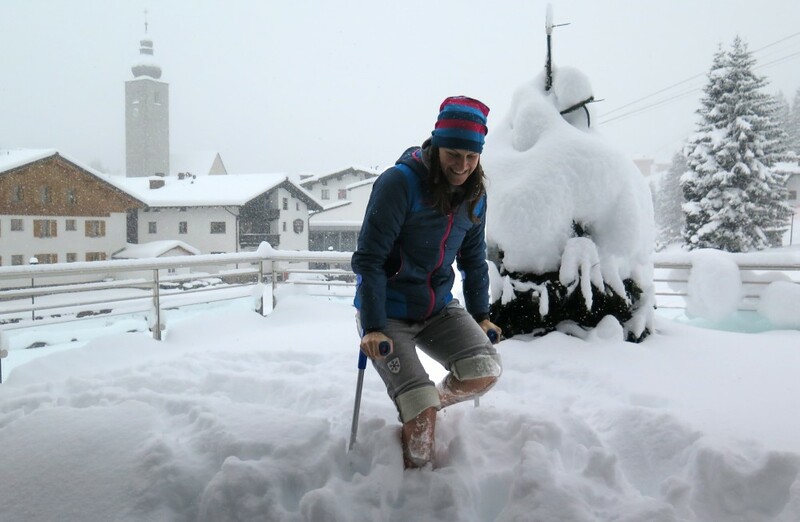 All I wanted was to just get back on my skis in time to join my friends at the FWT stop in Fieberbrunn. The title lost a lot of the importance it used to hold for me. Psychologically, that was a really interesting learning curve for me. I realised then that I had focussed too much on the overall title the previous season, instead of directing my focus from one event to the next, aiming to just ski my best at each competition. Since I was so happy to be back competing on the FWT only 5 weeks after breaking my ankle, I was completely free in my mind during the competition. That, and a good dump of soft, fresh snow, helped me in skiing a solid line and finally placing third in the women’s field. Things weren’t as easy for me during the following stop in Arcalis, Andorra. The hard snow, flat landings and bad visibility at inspection freaked me out. Would my ankle be able to handle that hard, tracked out snow? And those flat landings? I was little inspired in choosing a line, but finally settled on one after getting some help from my mates, and decided it would be ok. I placed midfield in Andorra after skiing a solid line, but one that lacked any higher airs or highlights. I just scraped through to qualify for Alaska, and for the FWT 2016, in seventh place overall. Puh! What a relief. My heart went out to the many good riders who weren’t able to make the cut, which is a particularly hard one this year. I’m going to use the time now until Alaska to ski as much as possible, get my skiing legs back and get completely dialled in with my new skis. Find out more about the 2016 Kästle BMX lineup here. Sylvie Steiner liked this on Facebook. Robert Eder liked this on Facebook. Christoph Niedl liked this on Facebook. Aseem Paul liked this on Facebook. Uwe Cazzolli liked this on Facebook. Alex Ryzhkov liked this on Facebook. Frank E. von Danwitz liked this on Facebook. Peter Stabolepszy liked this on Facebook. Sam Foster liked this on Facebook. Michael Neumann liked this on Facebook. Xavier Lambrix liked this on Facebook. Michaela Brugger liked this on Facebook. Melanie Mader liked this on Facebook. ????? ?????? liked this on Facebook. Arno Jost liked this on Facebook. ReGina Krynedl liked this on Facebook. Helge Bumb liked this on Facebook. Katrin Strobl liked this on Facebook. Maximilian Jagg liked this on Facebook. Sascha Schmid liked this on Facebook. Arne Sandvik liked this on Facebook. Nadine Rieder liked this on Facebook. Nick Poulsen liked this on Facebook. Veronika Stadler liked this on Facebook. Maïtena Berton liked this on Facebook. Ludwig Kyral liked this on Facebook. Rod Morrison liked this on Facebook. Hi Lori, great read. Probably one of the biggest challenges athletes face with wanting to get the results, coming off injuries and tough conditions. Despite all, sounds like you are doing incredibly well, keep going and most of all enjoy! Thanks Winston! I always really appreciate your comments, thanks for all the great support you give me 🙂 How are you doing? Is Bregenz going well? Angelika Kaufmann liked this on Facebook. Els Boerhof liked this on Facebook. Hu Go liked this on Facebook. Alexandra Dellis liked this on Facebook. Kandera Michael liked this on Facebook. Andreas Aczel liked this on Facebook. Christof Laufersweiler liked this on Facebook. Thomas Seidl liked this on Facebook. ???? liked this on Facebook. Thérèse-Marie Becker liked this on Facebook. Flo Zangerl liked this on Facebook. Hermann Fercher liked this on Facebook. Isabella Staffner liked this on Facebook. No Working on Powder Days liked this on Facebook. Frances Hind liked this on Facebook. Tamara Huber liked this on Facebook. Josef Vytlacil liked this on Facebook. Matthew Gray liked this on Facebook. Natty Jean liked this on Facebook. Snowsportsgroup Racing liked this on Facebook. Adrienne Toumayan liked this on Facebook. Franz Müller liked this on Facebook. Chuni Lal Thakur liked this on Facebook. Alex Horvath liked this on Facebook. Yes Amazing ! Do you arms get tired holding those fast Kastle up so high ? Christine Joy Hayes liked this on Facebook. Björn Joch liked this on Facebook.